S H A R E T H E C A R E , I N C .
A not-for-profit organization providing services that support Central Florida Family Caregivers since 1986. 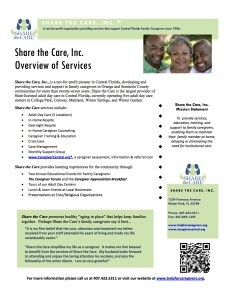 Share the Care, Inc., is a not-for-profit pioneer in Central Florida, developing and providing services and support to family caregivers in Orange and Seminole County communities for more than twenty-seven years. Share the Care is the largest provider of State-licensed adult day care in Central Florida, currently operating five adult day care centers in College Park, Conway, Maitland, Winter Springs, and Winter Garden. A home away from home that provides care and companionship to frail, physically and/or cognitively impaired adults who need assistance or supervision while family caregivers work or take time for themselves.
" Share the Care simplifies my life as a caregiver. It makes me feel blessed to benefit from the services of Share the Care. My husband looks forward to attending and enjoys the loving attention he receives, and also the fellowship of the other clients. I am so very grateful! " Please visit the Share the Care website at www.helpforcaregivers.org or call (407) 423-5311. Share the CareTM is a non-profit agency providing services and support to family caregivers, enabling them to maintain their family member at home and delay or eliminate the need for institutional care.